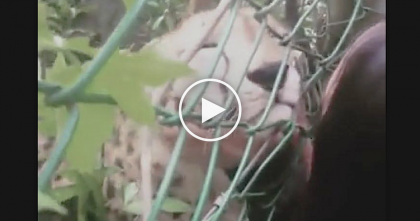 VIDEO: This Cat Has Taught Himself Something Impressive…Watch How He Gets A Drink, WOW. This cat is quite the smart cat! — Most cat’s drink from a bowl, but this cat? He’s VERY different and chooses to use the water dispenser cooler! He puts his paws up and knows just the right amount of pressure to get the water he wants, it’s pretty darn cute! – It’s almost like a kitty drinking fountain! 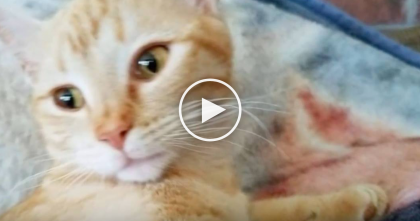 Oh my goodness, this cat is SMART—SHARE this story wit your friends! 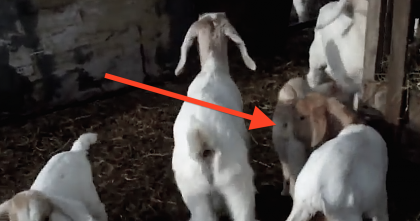 They Noticed Their Cat Was Hanging Around The Goat Pen, But Had NO Clue THIS Would Happen! Cat Goes Everywhere In Stroller, But Take A Closer Look At Her Eyes… What Are Those Sunglasses?? 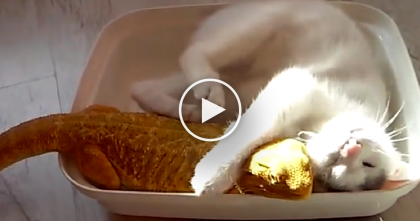 Fluffy White Kitten Finds “Surprising” Snuggle Buddy, But Never Wants To Leave… SOO CUTE.